£ In stock! Order now! A non-hazardous & non-flammable Fabric Paint used for restoring or changing the colour to Fabrics. 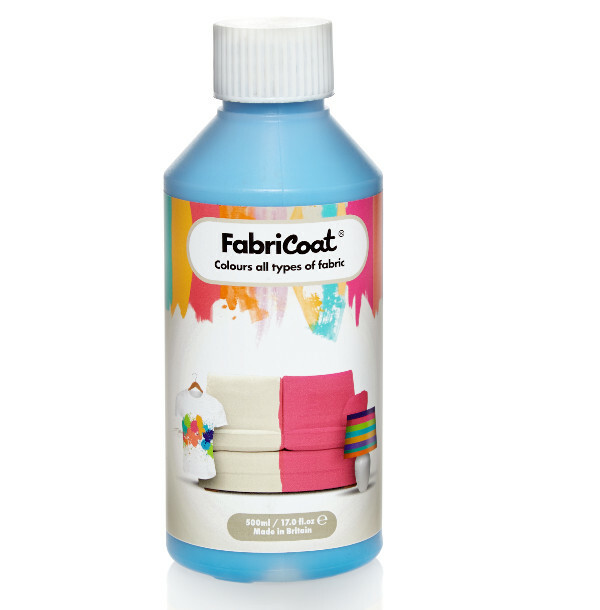 This fabric paint can be used to refurbish faded and damaged fabric or transform it into something new. Spray onto fabrics as a Fabric Spray Paint. Paint onto fabrics using a paint brush, stamp or stencil. Wash into fabrics for a colour wash effect. or Sending sample for colour match. Helps penetration of Fabricoat into stubborn fabrics. 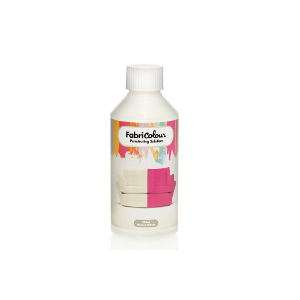 Fabricoat is a brilliant extension to our range of Leather Paints allowing anyone to simply pick up a bottle and apply to any fabric to restore or change the colour. Fabricoat can also be used to create individual designs and patterns. Once applied Fabricoat remains soft & flexible providing a lovely finish to be enjoyed for years. It soaks into all absorbent materials and once dry it will not make the material go hard or stiff. 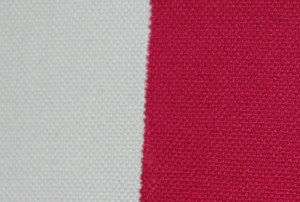 The photo (above) is an ivory fabric we have changed to pink, showing how the product has soaked in without changing the look or feel - you can still see the weave perfectly. This item is made to order and is considered a bespoke product. 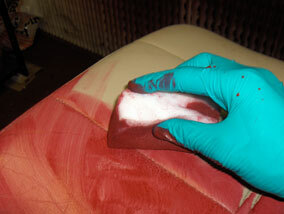 A 250ml bottle of Fabricoat is enough to restore the colour to items such as a car seat, small armchair or dining chair. If kept in a cool dry place Fabricoat will last for years. Try not to expose Fabricoat to temperatures below 6 Degrees Celsius and never let the product freeze. 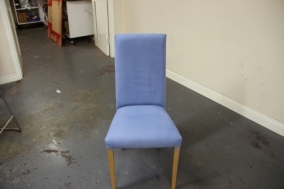 Dining chair changed in colour from Ivory to Blue. Make sure the material is clean and free of dust. For best results the fabric must be the same colour or lighter than the colour you are applying. The material must also be absorbent. Thin the Fabricoat down with 50% water, or Penetrating Solution, which will help penetration into stubborn fibres. 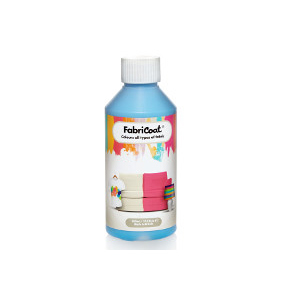 Fabricoat can be applied by brush, cloth, spray or by submerging the fabric in a bucket. Each method will give different results depending upon what you are restoring. Fabricoat can then be dried with a hair drier or left to dry naturally. The material will be usable within an hour but it will continue to strengthen over the next 72 hours. This guide will show you how to change the colour of a leather sofa. 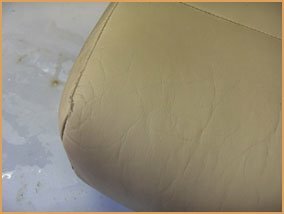 We will be changing of a small seat from a light beige colour to maroon to demonstrate the correct procedure of changing the colour of leather. A colour change can be made from any colour to another, i.e. black to white, or white to black, with just as successful results. The leather colourant kit used in this guide can be used to change the colour of all leather, vinyl, plastic, PVC & leather cloth car interiors. 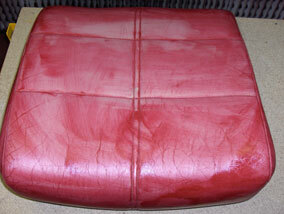 This photo shows a cinema seat we will be changing from beige to maroon. 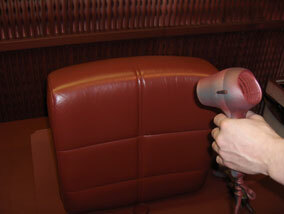 We did 54 seats, 54 backs & 60 arm rests, all of which are used on a daily basis in a London Cinema. The first step is preparing the leather ready for applications of colour. We do this to remove any waxes, oils or silicones that may be present on the leather, not removing these could cause adhesion problems. 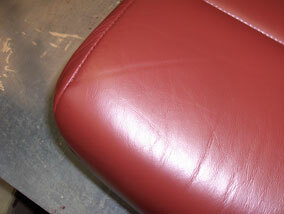 Prepping the leather also removes the manufactured finish. 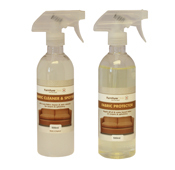 If the leather is very dirty, clean it first with the leather ultra clean or warm soapy water. 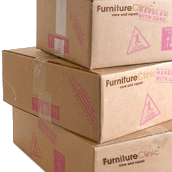 Because the seating cushions and other areas come under more stress (wear & tear) it is more important to prepare them. 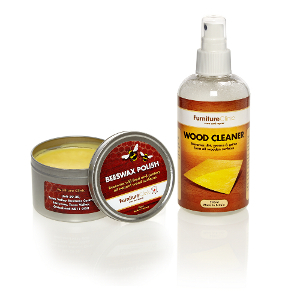 To do this it is best to rub them with the leather prep and an abrasive pad, this application removes the leather finish. A good way to apply this is to place two cotton wool balls on the abrasive pad and then wet them in prep, fold the abrasive pad over the balls and then use it to rub the leather. This way applies the prep in the correct and sparing way making the product last longer. Prepping the leather in this manner will remove any creased and cracked areas on the leather. So it not only makes the leather ready for colouring but it greatly improves its appearance. Any severe cracks can be filled using heavy filler. 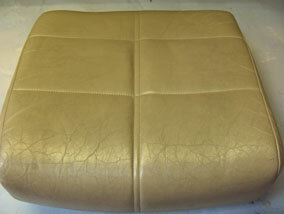 The leather is correctly prepped when you start to see colour transfer from the leather onto the abrasive pad or cloth. This indicates that the finish has been removed exposing the colour beneath. 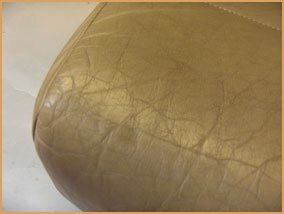 Any distinctive creases in the leather may wear through quicker than other areas once colour is applied (this would only happen on a colour change job, and is just a maybe). To reduce the chance of this happening wet some fine grade sandpaper (320+) in leather prep and rub along the crease to reduce it. Then proceed to the next step. The previous step will have removed the manufacturers finish and any silicones that are soluble in solvents. There are however some silicones like spray on polish and waxes that aren't soluble in solvents, and so to remove these we need to use the alcohol cleaner. 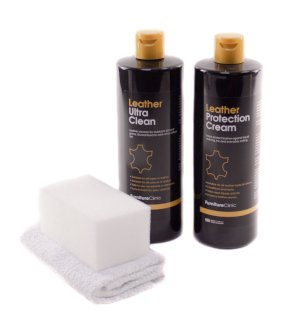 After using the leather prep wipe the leather down with a cloth dampened in the alcohol cleaner and for ease of use you could also spray the alcohol cleaner directly onto the leather. Now wait 30 minutes for the cleaners to evaporate. Shake the bottle of colourant for about 3 minutes to make sure it is well mixed. Pour a small amount onto a sponge and rub into the leather. The idea is to sponge on a thin coat of colour working it into any gaps, creases and hard to reach areas. Apply light pressure here to work the colourant into the grain. If you apply too much pressure you may get a foam of colour on the surface, this is not a problem, just wipe it away with the sponge (gently). 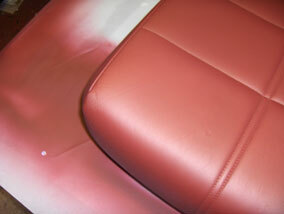 The image to the left shows what the leather should look like after one application of colour. DO NOT try to achieve a perfect finish with the first coat. The colourant dries naturally or you can speed it up with a hair drier. After applying one base coat, apply two more coats of colourant in the same way as before. 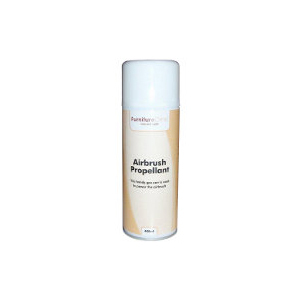 You can actually achieve a good finish without even spraying any colour on! However it is best to spray some on as well. Wait 30 minutes for the colourant to thoroughly dry and then proceed to spray the colourant onto theleather. Set up your spray gun or airbrush and then spray the leather at a comfortable distance, being carefull not to over apply the colour. It is best to practice a bit on a piece of paper to get the hang of spraying first. Spray the colourant on in thin layers. This avoids runs and so makes for a nicer finish. Because the colourant we're using is water based it takes a few minutes to dry. 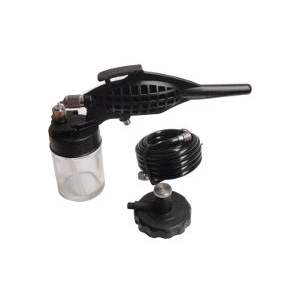 We therefore advise you to spray one area and then dry it using a hair drier. Doing it this way reduces the chance of runs. If you do see a run, just wipe it off with a cloth or sponge and then re-spray the area. There is no right number of coats that should be applied to the leather. Spray on one coat and dry it off, then just keep spraying on a coat at a time until all the base colour is hidden. 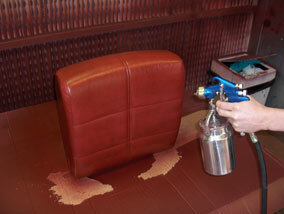 When you are happy that sufficient colourant has been applied, the Leather Finish should be sprayed on to the leather. First apply the glossy Super-Seal, in three-five coats, this forms the base of an incredibly flexible and durable finish. 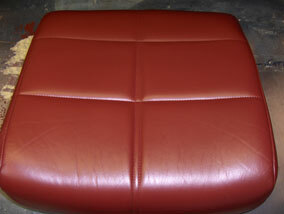 The glossy appearance, if unintended, will be altered to the desired finish with the application of the Leather Finish. After the super-seal has been given sufficient time to dry, the remaining leather finish should be applied, again using the entire contents of the bottle provided to cover the entire area in between three to five coats. Always remember to leave sufficient time for each coat to dry before applying the next. The above two images are of the seat thoroughly coloured. As standard the leather has a slight shine to it. This can be either increased using a gloss finish, matted down using a matt finish or kept the same using a satin finish. 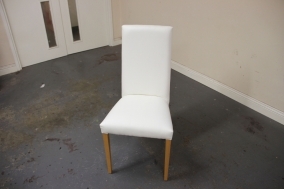 Our customer required a matt finish for this item, which is shown in the pictures below. 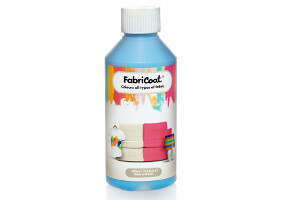 Can I use Fabricolour on any fabric item? Yes, Fabricolour is incredibly versatile and can be used on any fabric item including; chairs, sofas & upholstery, clothing, curtains, car interiors, carpets and many more! Will it change the feel of my fabric? 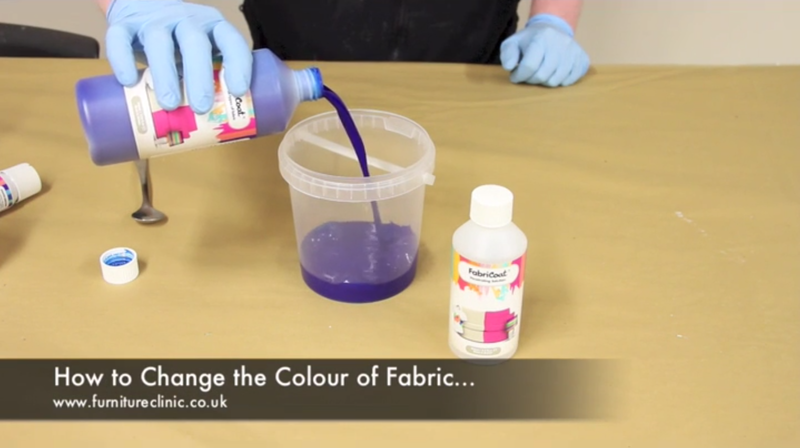 No, Fabricolour is designed to dry with a soft, flexible finish, allowing you to recolour or change the colour of your fabric items without changing how it feels. I have a specific colour in mind, can you supply it? Of course, we can supply any colour you require. When ordering either choose a colour from our range of standard colours, or if your require a custom colour simply indicate that you will be sending a sample using the option available when you add Fabricolour to your basket, and send us a sample. This sample will then be perfectly matched by our expert team and sent out to you. How do I use Fabricolour to chage the colour or recolour my fabric items? How soon can I use my item after applying Fabricolour? Items should be left for at least an hour until the Fabricolour has completely dried, after which they should be safe to use. However, Fabricolour will take 72 hours to cure and strengthen completely, so it is not advised to use any cleaning solutions or other treatments on your fabrics for 72 hours after applying Fabricolour. Can I continue to clean and maintain my fabric items as normal after applying Fabricolour? Yes, in fact we would positively encourage it. After allowing 72 hours for Fabricolour to completely cure, you should always clean and protect your fabrics regularly in order to extend their life and guard against future dirt and staining. We recommend the use of our Fabric Care Kit for this, combining powerful cleaning and protection in one handy kit. 72 popular colours that match our range of Leather Colourants. 16 base colours that can be mixed together to achieve any colour you need. 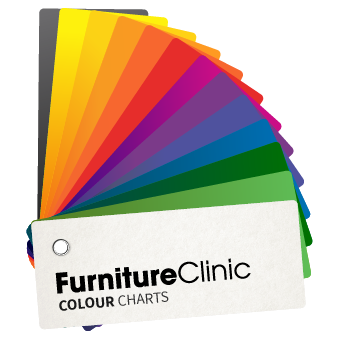 Any colour from any of our colour charts online; leather or fabric. By sending us a piece of material to match to. We use an advanced colour control machine to maintain and monitor our colours with a database of over 10,000 individual colours stored. This allows us to make virtually any colour or shade that you want! If you want an exact colour match send us a sample of material and we'll match it for you. 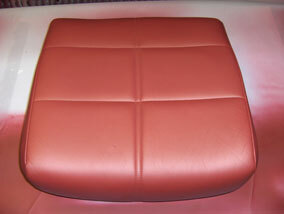 We have colour charts for car makes in addition to our own colours to match all leather and fabric. Helpful instructional videos showing you how to use our products to clean, repair and restore leather. Order before 2pm to receive your order tomorrow (see conditions).